Metallic kitchen design means more than just taps, handles and pots and pans. From wallpaper to flooring, appliances to furniture, these days metal is creeping into our homes in all kinds of guises. Whether you’re considering the industrial trend or simply looking for ways to introduce a touch of glamour to the most hardworking room in the house, there is no material more versatile. Tap into the magic of metal and discover how to add the perfect lustre to your kitchen. Stainless steel is no longer limited to commercial kitchen use, it is finding a niche in contemporary kitchen design too. Not only is this material more environmentally friendly than wood, it’s also easier to clean and ideal for accentuating a clean, minimalist interior. Your kitchen will be a stylish modern mecca when outfitted with stainless steel cabinet doors, or even an island fashioned from steel sheets. But, if you’re looking for something your neighbours won’t have, then distressed gunmetal steel makes for a unique choice in a contemporary cookspace. Also, hot-rolled galvanised steel results in a different look each time, so no two sheets will ever be the same. 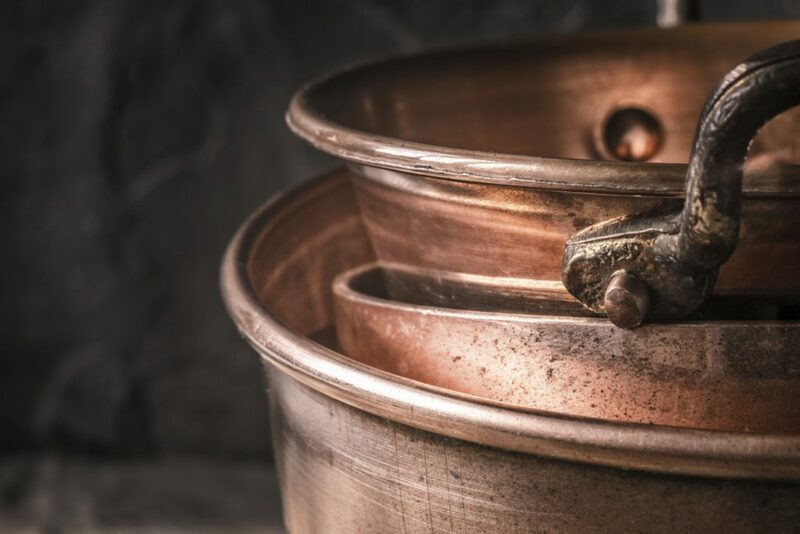 Draw inspiration from yesteryear by choosing copper and its alloys, brass and bronze, to give your kitchen that curated look. A revival in styles such as vintage, rustic and farmhouse have seen many homeowners opting for finishes that play into the ‘modern-meets-classic’ theme. Polished copper worktops, countertops, and islands make a striking impact and can be finished with an epoxy resin to ensure surfaces remain easy to clean. However, for a less expensive but equally impressive option, swap the handles on your kitchen cabinets from wood to brass or usher in a cool copper glint by hanging pendant lampshades over a workstation. Express your personality by mixing together both warm and cool metals to create a one of a kind look. Pairing antiqued bronze pulls with bold copper pendants and a sleek, steel backsplash will create a truly unique space. Consider mixing textures too, adding a few natural wood elements will strike a more delicate balance. But don’t forget the details. While backsplashes, countertops and hanging hoods are all eye-drawing focal points, it’s the finer details that make the biggest impact and accessories are the best way to start dipping your toe into metallic kitchen design.